Now you can play your favorite songs on your uke along with great-sounding tracks! 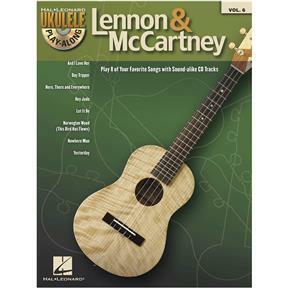 Just follow the written music, listen to the CD to hear how the ukulele part should sound, and then play-along using the separate backing tracks. The book includes melody and lyrics, and the audio CD is enhanced so Mac & PC users can adjust the recording to any tempo without changing the pitch. Features 8 classics from John and Paul: And I Love Her • Day Tripper • Here, There and Everywhere • Hey Jude • Let It Be • Norwegian Wood (This Bird Has Flown) • Nowhere Man • Yesterday.